Our lovely shaded picnic spots for day visitors is open every day of the year from 8:00 until 18:00. 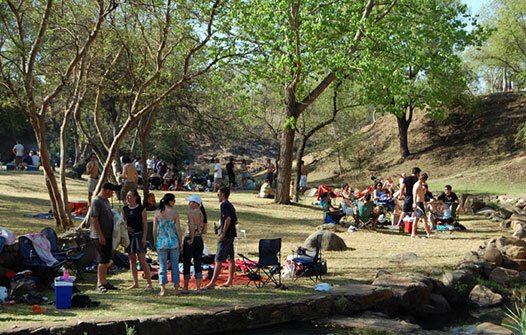 There are five shaded rondawels and convenient braai facilities. Clean and neat ablution facilities are also close. Our tuck shop is open on weekends and sells sweets, coldrinks, chips, charcoal, wood and ice cold soft-serve for those hot summer days! Parents can keep a close eye on their children while they play on the jungle gym or take a plunge in the pool. The iconic waterfall, falls into a magnificent rock pool an sets the scene for a lazy tranquil day.